The Nissan Grand Livina has been a huge success for Tan Chong. Since its introduction here in December 2007, the three-row seven seater MPV has found over 43,300 new homes. It also marked the beginning of the decline of the Toyota Avanza, the car that started the affordable MPV market here. The Livina has been around for more than three years now in its original form, and it’s time for a minor change facelift. Visually, the facelifted Grand Livina is distinguished by its new-look front grille. Like before, the 1.6L model gets a “smoke-plated” design while the 1.8L is given a full chrome grille. Nothing else is changed other than the adoption of LED side indicators on the wing mirrors. Inside, the ambience is vastly different, as the cabin is now finished in black instead of beige. This might not help the impression of space and airiness, but some might like the “sportier feel”. The three-pod instruments are now white faced from the previous black, although the studio pic above shows a nice grey “watch dial style” face. It’s the lighting and angle, perhaps. The top spec 1.8L also comes with a head unit that has AUX input. 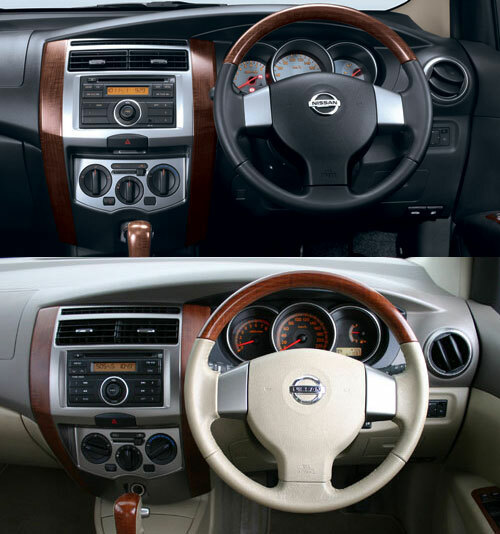 The wood trim shown is also only for the 1.8; the 1.6 gets silver trim, but none on the steering wheel. If you fancy the brown leather shown here, it’s a RM2,000 option. Otherwise, it’s black fabric for both the 1.6 and 1.8. There’s no change under the skin. The Grand Livina is powered by the all-aluminium HR16DE 1.6 litre (105 PS at 5,200 rpm, 150 Nm at 4,400 rpm) and MR18DE 1.8 litre with CVTC (126 PS at 5,200 rpm, 174 Nm at 4,800 rpm). The gearbox is a four-speed auto, with a five-speed manual option for the 1.6L. The on-the-road price inclusive of insurance is RM86,800 for the 1.6 MT, RM89,800 for the 1.6 AT and RM98,800 for the 1.8 AT. Hi res pics after the jump.